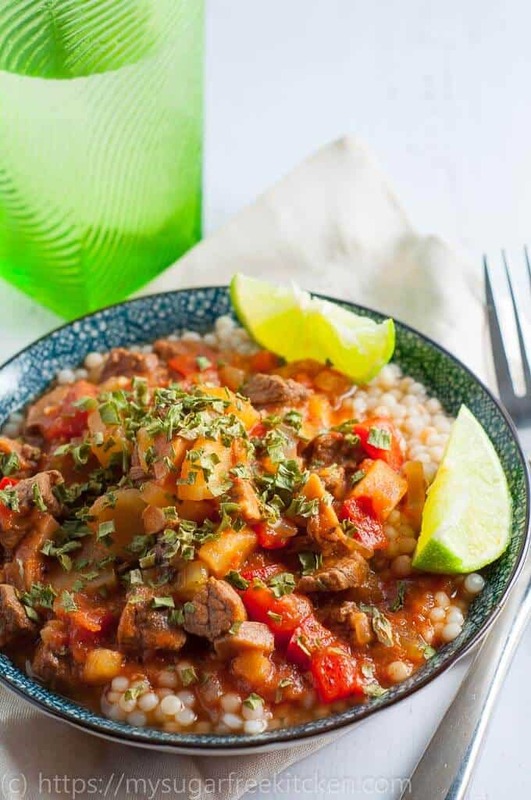 This slow cooked Moroccan beef stew is a rich, hearty and aromatic meal, perfect for cool winter nights. Packed with spices, tomato flavour and vegie goodness, this is a stew you won’t tire of. The meat is meltingly tender and every mouthful leaves you wanting more. 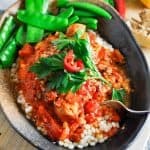 I love putting on the slow cooker on the weekend so I can smell the aromatic spices wafting through the house as it bubbles away. 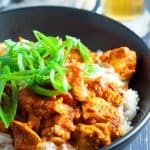 Like the time I made this Spicy Moroccan Chicken in the slow cooker! Then, as it gets closer to being done, it’s the build up of anticipation that is both enjoyable and slightly annoying at the same time – especially when you’re holding out and saving your appetite for that nights dinner. For me I love thinking about the healthy home cooked comfort food I’m going to enjoying in front of the TV with my husband Terry and Charlie, our staffy. He is a complete couch potato. I recently purchased a new slow cooker after my old trusty machine gave up after 6 years, and I’m kind of glad that it gave up. My new one is a little more upmarket. The kind where I can brown the meat in the slow cooker bowl without having to dirty a separate frypan. Definitely way more convenient having less stuff to wash up! Plus it is small and more powerful. 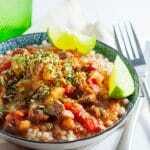 This stew is an awesome weekend recipe to put on around mid morning. Its about 15- 20 minutes prep and that’s it. Everything is in the slow cooker, and all you have to do is come back in 8 hours and dish it up! Set, Forget, Dish up and EAT! 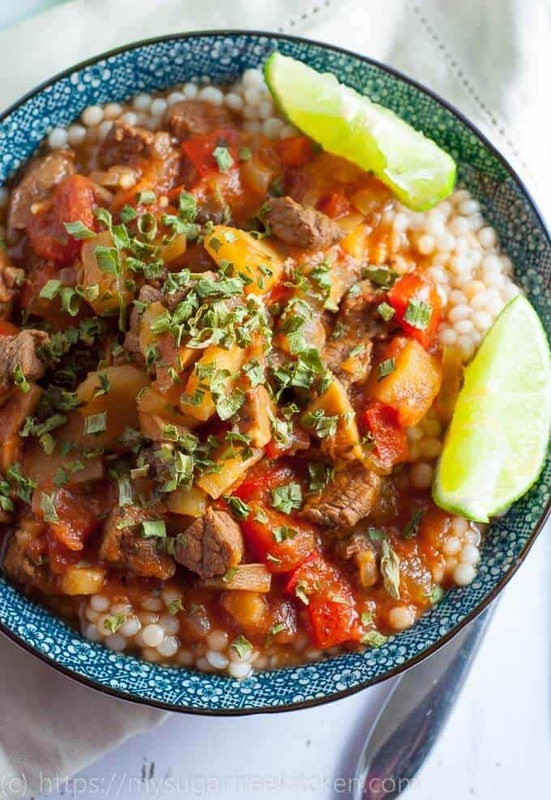 Love Moroccan Inspired Recipes? You need to check out these Slow Cooker Moroccan Beef Meatballs, so juicy and tender, they are the best meatballs I’ve ever made! One of my little tricks to get that nice rich gravy that slow cooked stews are often known for is actually two things. Cornflour and Gravox. But not together. 1 teaspoon of cornflour to 1 tablespoon of water and mix into the stew. 1 teaspoon of gravox powder (beef for a beef stew) and 1 tablespoon of water and mix into stew. You do need to mix these in a separate small cup or jug, then add to the slow cooker pot just before serving to thicken the sauce up. It works a treat when it looks like it needs just a little bit of extra help. Brown rice and green peas – adds an instant pop of colour! Why not try it with some zucchini noodles. This one is on my list! In my book slow cookers are an essential winter appliance. Even for me who lives in an almost tropical climate here on the sunshine coast in Australia. It’s winter right now and the temperature during the days is low 20’s – no jacket required, shorts OK, singlets if you’re game! 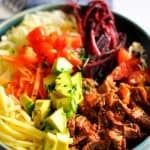 If you’ve got an itch for meltingly tender, rich, spicy beef, check out this pulled beef done in the pressure cooker that I used to create mexican taco bowls. 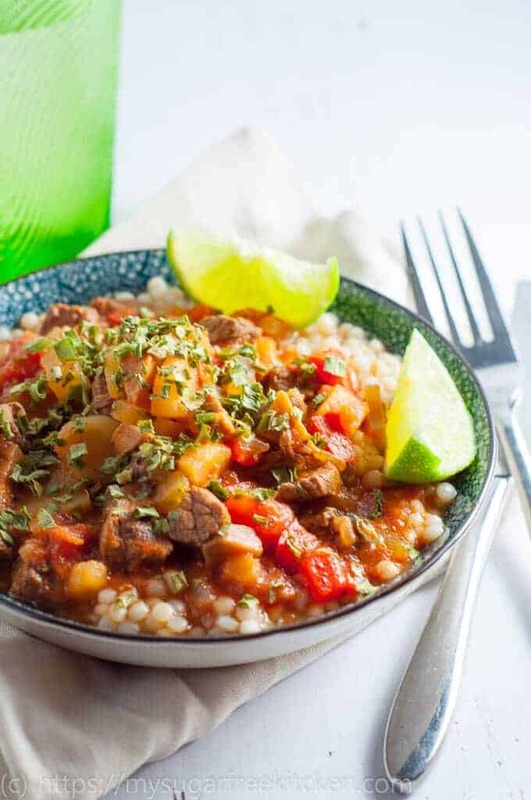 This slow cooked Moroccan beef stew is a rich, hearty and aromatic meal perfect for cool winter nights. Packed with spices, tomato flavour and vegie goodness, this is a stew you won’t tire of. Add the spices and mix in well. Add the garlic, tomato paste, and tin tomatoes. Stir to combine. Add the water – about ¼ of a cup. Remember there will still be juices that come out of the meat and the other liquids will thin out as they heat, so better to no add too much additional liquid aside from the ¼. Set to cook on low for 8 hours. 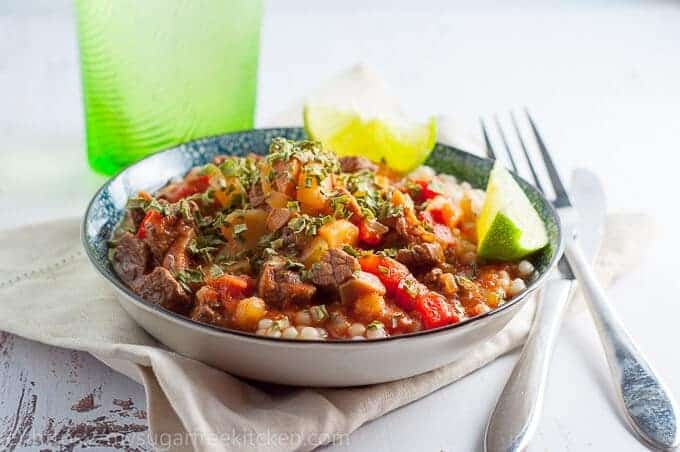 In leiu of the all the spices listed above, you could just try using 3 tablespoons of Moroccan seasoning if that is all you have on hand – for example, sometimes I use the masterfoods Moroccan seasoning when I don’t feel like measuring out all the spices. BUT, I have to say that doing the spices from scratch, does make for a much tastier, richer dish! 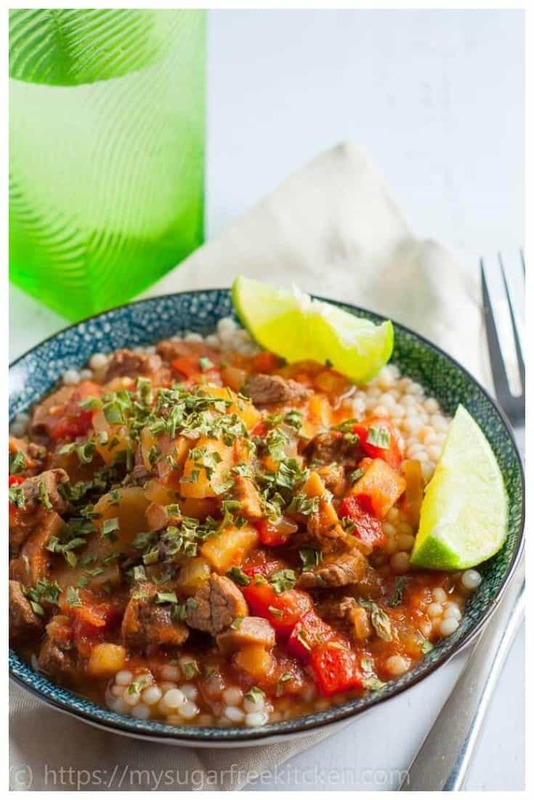 This stew freezes perfectly so if you are making ahead, divide up into portions and store in the freezer for up to 8 weeks.